He said the Eurasian Union has been informed of Kazakhstan’ agreement, adding that with examination of the roadmap for Iran-Kazakhstan cooperation and settlement of the existing problems efforts are being made to enable Tehran and Astana to experience expanded trade activities more than before. 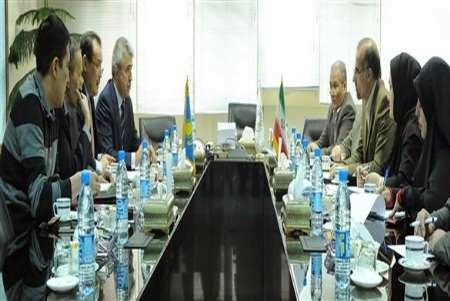 He referred to the visit of a Kazakh trade delegation to Iran in October and said soon an Iranian trade delegation will visit Astana, adding that Kazakhstan is a big country and neighbor of Iran and thus Iran is ready to set up an exhibition there. Meanwhile, Ambassador Kultayevich underlined the importance of the agreements which have been reached between the two countries and said follow up of the agreements will remove problems sooner and Kazakhstan will not hesitate to render any assistance in this regard. He called on the Iranian companies which have contracts with his country to take utmost advantage of investment opportunities in Kazakhstan as such privileges are not offered to every country. In a recent visit of President Hassan Rouhani to Kazakhstan a memorandum of understanding for commercial, industrial, mining and investment roadmap was signed between the Iranian Ministry of Industry, Mines and Trade and the Kazakh Ministry of Development and Investment.